Hello, I am using some audio to animate some parameters in my compo. When I export, those animations don't work. I know that Smode doesnt export audio until 8.4. What I'm trying to do is just get the animations to sync up when I align the exported video with the audio i used to animate it. Version 8.4 solves both problems and the good news is that it will be released very soon and if you send us a PM at support@smode.fr, we can already provide you with a beta version now. I am having the same problem, even in Smode 8.4. I'm using a wav Beat and I've linked some parameters to it, it work fine in the time line but when I export it, nothing happens. Is there an export parameter or a specific video format that I have to use? 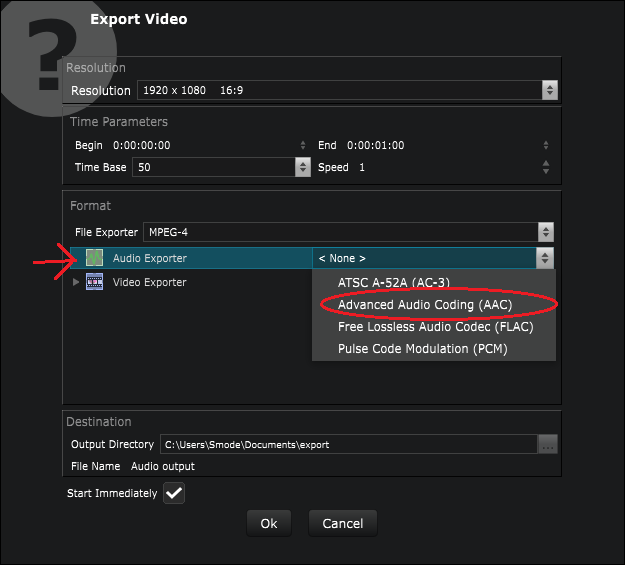 Do you try select Advanced Audio Coding (AAC) ? Did you try to export "Audio output.compo" in Miscellaneous Features ? I'm using AAC and am having the same issue, the audio makes it into the videofile, but smode does not react to it. For instance~ Exporting the Audio Output.COMPO results in a black/blank video with the guitar sound looping. Please check for update, Smode 8.4.10 is out and available for download. May be this should fix your issue.